Linear Accelerator’s elongated oval shaped light sculpture’s intense colors glow and flicker from purple to orange to green, responding to approaching and departing trains and passenger activity along the station platform. 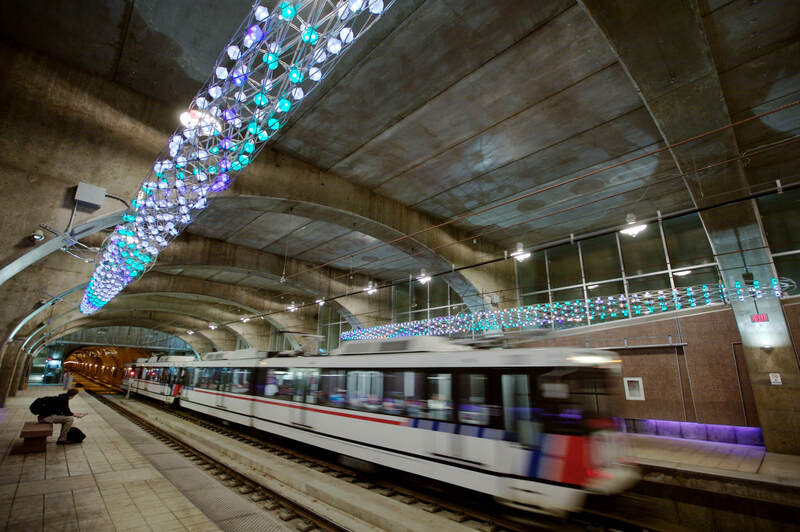 Consisting of hundreds of individual orbs, each with light emitting diodes and independently operating integrated circuits receiving broadcast transmissions from a central computer, the displays respond to the amount and movement of people on the platform. The lighting will be calmer and quieter with fewer people inhabiting the platform and will grow more animated as the platform grows more crowded.